The water thunders over the rock ledges of Mary Ann Falls in Cape Breton Highlands National Park in Nova Scotia, Canada where the scenery around the area consists of lush greenery and wilderness. Mary Ann Falls drops 20 feet to the pool below and when standing above at the platforms, the scenery is breathtaking. People visiting Cape Breton Highlands National Park can see Mary Ann Falls from the platforms provided around the area but for a closer look, a hiking trail is open to the more adventurous tourists. To reach the falls, one must follow the Cabot Trail and head North through Ingonish, turn left at the marked signs until passing Broad Cove Campground, all of which is found in the beauty of Cape Breton Highlands National Park in Nova Scotia. 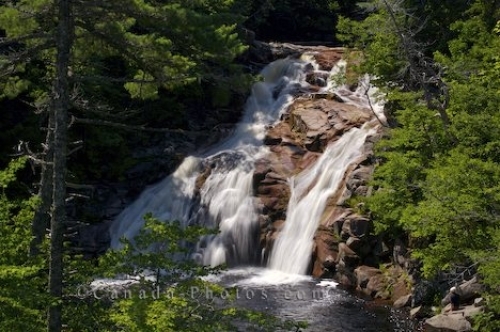 Picture of the beautiful scenery of Mary Ann Falls in Cape Breton Highlands National Park in Nova Scotia, Canada.